So while sitting at the dining room table for most of the weekend studying for my Poly Sci course I decided I needed a little encouragement. After eating this I'm not quite sure which will be the death of me first, Poly Sci or this. 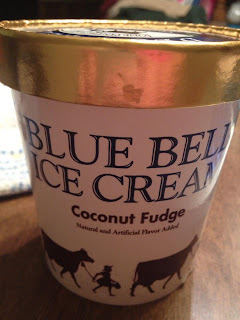 If you've never tried this flavor from Blue Bell, run or drive since it's still 127 degrees here in Texas to the nearest grocery store and buy it. It is one of the best flavors they have come out with. It's ice cream with shredded pieces of coconut layered all through out with multiple swirls of chocolate fudge. It's like eating a frozen Almond Joy candy bar with out the almonds. It is at this very moment I feel for the people who live up North or really any where that Blue Bell is not sold. There is absolutely no comparison. Ben & Jerry's does not even come close. Neither does Dryer's. Blue Bell is the bomb! Oh my goodness! I MUST try this!! It's going on my grocery list right now!